Maybe it’s the smallest surrenders that make the greatest growths in the soul. In my life, at least, it’s easier to rise to the challenge in the big things: the obvious challenges. When it know great things are being required of me, it feels as if there’s less of a choice … Of course I need to do this thing in front of me! But when it’s not so clear, and when it’s a small thing that needs to be done, I end up much more inclined to war with myself over the actual doing of this thing in front of me that may or may not ever be recognized for the strength it took to do. This past week God asked something of me. I felt the nudging for a few days and, for those few days, I fought. God, please don’t ask this of me. Not now. I can’t handle anything else at the moment. You know my plate is full-surely this isn’t really Your voice … But I knew it was. And I knew I simply had to decide: would I, or would I not, listen to His still, small voice? During our afternoon walk on Tuesday I told M about my struggle. I didn’t tell her what it was; I was too cowardly yet to be held accountable in that way. After listening to my agonizing, she simply responded that “I sense this will ease a burden, and lighten a load for you.” No! I wanted to argue … You don’t understand: THIS, that is being asked of me, is the burden-that’s my problem! But I knew she was right. And somehow, in the mere speaking of the struggle, I knew I could say “yes” to Him. By the end of our walk, I was able to truthfully tell M that I was at peace now-not because I looked forward to it, but because there was a peace in the resolve of the decision being made. Yes. By Friday afternoon’s walk, I was able to thank M for the part she had played, and able to tell her the details of the nudging I had said “yes” to. It was indeed a small thing. And, you know, I don’t believe He would have loved me any less if I had held onto my will in this “small” thing. But I would have missed out. The things He asks of us are those that will make us more real. More whole. “Life is strange with its twists and turns, as every one of us sometimes learns . . . “ In my grandmother’s house there is a wall hanging with a poem written on it. My brain has a tendency to grasp onto words and roll them around incessantly. Sometimes these are words that I particularly like the sound of. Other times, though, they are just words. Words that stick whether or not I consciously like them all that much. This poem falls into the second category. I don’t particularly like the poetics of it and, though it is true enough, don’t even particularly care for its platitude-like nature. But ever since I was old enough to read, and retain, its words, they have reappeared in my brain every time something happens that reminds me of them. This is one of those times. Last week we had a scare: an attack in the city that led to a sort of lockdown. In the immediacy of it, all I was concerned about was the disruption to my intended schedule: What would happen to the music team when I couldn’t get there for practice? How would I get the weekend errands done if I was not allowed to bike around as usual? Would the little ones understand when they didn’t get to go to library for preschool story time? All very small-minded questions, when it comes down to it, considering the greater scale of terror that had just occurred in other lives. But I’ve always struggled to really grieve [and even really care] about things that do not seem to touch my own sphere of people or life; I am not proud of this emotional handicap, and it has led to prayers I have prayed for the breaking of my heart. As the day of the attacks wore on, however, I began to notice some strange things going on in my otherwise-unaffected self. I was overreacting, for one, to normal interactions. And I was on a bit of a high, more hyper than usual for a Sunday. Most strikingly, however, for me, was the fact that I couldn’t seem to communicate effectively: conversations that are usually easy territory for me were a struggle. By afternoon I was piecing together the bits into a realization that I was reacting to a past part of my life. Here I was, living in a city where nothing but safety has been evident for the year plus in which I have lived here. Our struggles just don’t go into the realm of safety. I had taken this feeling for granted, clearly, so that now, illusion shattered, I was feeling the fears of the life I led two years ago: fears that were constant. But this afternoon it was a fleeting sort of fear that, once recognized, was easily dealt with. In between bread risings, we went out for a walk. Starting to walk, however, I stopped, took off my shoes, and started to run. I didn’t bother explaining anything, in words I knew I didn’t need to. After running for a while, I came back to him to resume our walk. “Feel better?” he asked. I nodded, and we carried on with the walk, and with the day. They say that “absence makes the heart grow fonder.” While true enough, in a poetic way, I think this is a bit of a misleading truth. A more accurate [if less poetic] statement may be that “long periods of presence combined with brief spurts of absence make the heart grow fonder.” This is a reality that I am struck by at the moment, away for a conference. While here, I find myself musing on the fact that for all the times I have wished to get away from the daily grind of my workplace, it takes no longer than one day away to be missing it . . . missing those children, and missing the coworkers who function as my family in so many respects. Yesterday, while still there, I found myself relaxing from my usual level of productivity-stress. 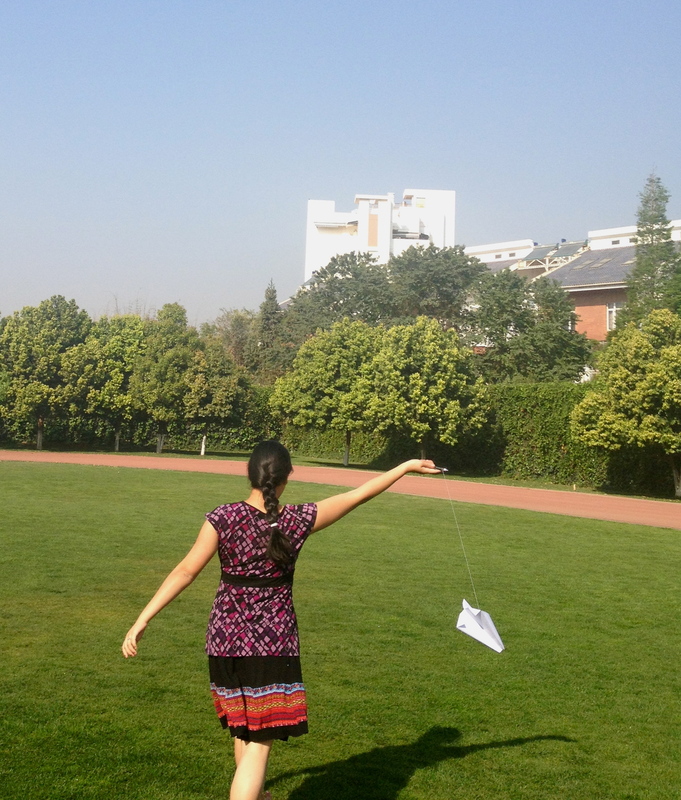 For one, I looked out the window to see a science class testing out some homemade kites. I walked out to watch, smiling with their teacher at how “cute” the kids were as they ran around barefooted in the grass. I snapped a few photos, collected a few unwanted kites [which now form a bit of a hanging display in the library], and then I returned to the parent letter I was writing at the time. For two, I snuck out again during lunch recess [I say “snuck out” because I generally stay put during recess so as to be available for potential check outs]. No one was seeming to want the library so I walked out to join the kids as they played. I smiled at the sight of one of my French students laying in the grass . . . contemplating life, or so it seemed. Watching her for a moment, I then walked over and, on impulse, laid down next to her. We did not say anything: just laid there watching the other children. After a few moments another child came over and laid down next to us. From the other side of the field I overheard a “Hey—what’s Miss J doing over there?” I looked over and waved at her, as a way of a response. And I smiled again. When it was time to go back inside I stood up, brushed myself off and wondered if I was wet from the dew. It didn’t really matter, though. Didn’t really matter at all.